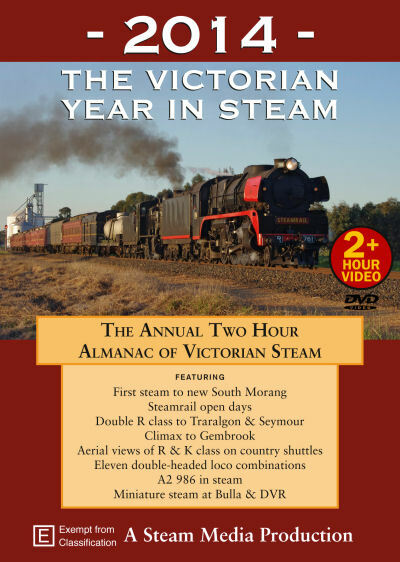 2014: The Victorian Year in Steam: This superb TWO HOUR and fifteen minute DVD comprehensively covers over 50 Victorian steam operations during 2014 featuring 15 different locos. Miniature steam at Bulla & DVR; and much more. 2014 provided a few firsts and the usual interesting variety of action on both main and tourist lines. Steamrail's open days saw seven locos in steam including A2 986. 14NA celebrated its 100th birthday and K 163 turned 50. Steam returned to South Morang for the first time since the line re-opened in 2012. The Climax geared loco and G 42 each made rare visits to Gembrook. Eleven double-headers are featured including R 707 & R 711 combining for the first time in the preservation era. Miniature steam at Bulla and Diamond Valley is also featured. Y 112 joined K 153 on shuttles at Ballarat. We take to the air to view Puffing Billy, R 761 and K 153 running local shuttles at Echuca and K 163 at Mornington. The ARHS museum re-opened and cabrides on six locos also adds interest to this production. Copyright (c) 2017 Stylized. All rights reserved. Designed by NodeThirtyThree for Free CSS Templates.